On behalf of the board of directors of the Sikh American Legal Defense and Education Fund I write to you today with some bittersweet and also exciting news. Late last year, SALDEF Executive Director Baldev Singh notified the Board that he would like to spend more time with family and retire from his responsibilities. Over the past several months, the Board have been developing a transition plan and aggressively working to recruit a successor to help carry on the successes that Baldev led. We’re forever grateful for Baldev’s deep contributions to SALDEF. Baldev has built many strong and vital coalitions throughout our industry to further SALDEF’s mission and the success of the Community. While change is never easy, I am so excited to share with you our newly appointed Executive Director. I am pleased to announce the appointment of Kiran Kaur Gill as our new Executive Director. You will hear from Kiran in the coming weeks, and her impressive bio appears below, but let me just take a moment to tell you why we feel so fortunate to have her as the leader of the organization. FIrst, Kiran is an accomplished professional with exemplary executive experience, she was the former president and CEO of PARS Environmental, Inc., a full-service environmental consulting firm based in Robbinsville, New Jersey. Additionally, Kiran has been a long-time advisor and volunteer for SALDEF, playing a critical role in the expansion of our Law Enforcement Partnership Program and the expansion of our SikhLEAD Internship to New Jersey. 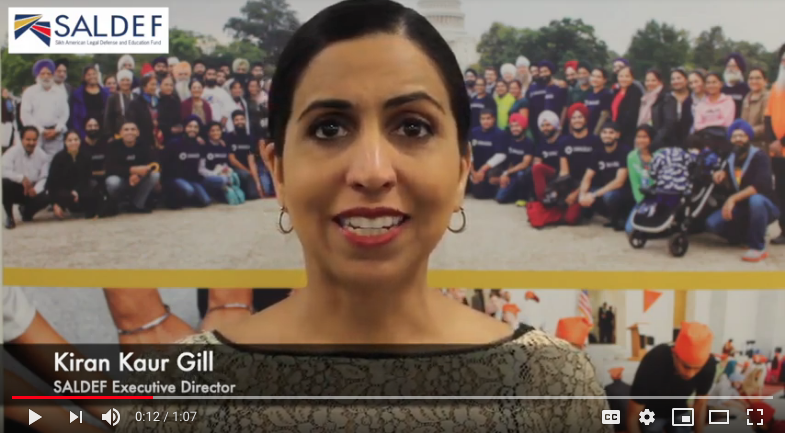 On behalf of the Board of Directors, we are so excited about Kiran joining the organization and I want to thank you for your ongoing support and your trust in SALDEF’s vision for strengthening the Sikh American community. Please join me in welcoming Kiran to SALDEF and thanking Baldev for his contributions. Kiran was the former president and CEO of PARS Environmental, Inc., a full-service environmental consulting firm based in Robbinsville, New Jersey. In 2014, Kiran was selected as ”Small Business Person of the Year” by the US Small Business Administration (SBA). She represented the State of New Jersey at National SBA conference in Washington, D.C. Kiran was also selected among the Best 50 Women in Business by NJBiz and listed among the top 40 Entrepreneurs under 40 by NJBiz the same year. In 2018, Kiran was named among the top 50 most influential people of color in New Jersey by ROI-NJ. In addition to her professional accomplishments, Kiran is involved in a variety of community and civic organizations. She is the president and a founding member of Inspiring South Asian American Women (ISAAW), an organization dedicated to promoting civic and community engagement among South Asian American women in New Jersey. She serves as a board member of The ONE Project, an interfaith and community coalition organized to address social needs through education and volunteerism, and she serves as the Community Service Chair of the NJIT EMBA Alumni Committee. Additionally, she and has volunteered for the Habitat for Humanity International, Global Village Program, Buenos Aires, Argentina, where she worked alongside a team of international volunteers and members of the local community to build quality, affordable shelters for families. Meet Kiran at the 2019 SALDEF National Gala, April 6 2019 at the Sherton Tysons in Tysons, VA. Please visit www.saldef.org/gala for more information and to purchase tickets. The first Asian Pacific Islander American elected to the U.S. Congress was Dalip Singh Saund, a Sikh American, in 1956. He represented California in the House of Representatives. Get a paid internship in Washington this summer with SALDEF. College, law students, and other graduate students will be placed in positions in Congress, federal agencies, and other DC-based organizations. Learn more and become a change-maker! The purpose of SikhLEAD is to inspire, train, and support a diverse, motivated and entrepreneurial group of young Sikh Americans as they prepare for a lifetime of community engagement and community leadership. SikhVOTE is a non-partisan, community-driven initiative to increase voter engagement and registration with in-language resources and materials. By registering to vote and voting Sikh Americans can make their voice heard and help determine the direction of their country. Started in 1999, the Law Enforcement Partnership Program builds relationships between local communities and law enforcement through educational programs, resources, and events. Don't miss updates from SALDEF. SALDEF is a national Sikh American media, policy, and education organization. Our mission is to empower Sikh Americans by building dialogue, deepening understanding, promoting civic and political participation, and upholding social justice and religious freedom for all Americans. © 2019 SALDEF. All Rights Reserved. SALDEF is a 501 (c) (3) non-profit.